let us know when your birthday is and you will receive 10% off your next salon service. Receive 20% off when you refer a friend and they will also receive 20% off, keep referring and keep receiving! 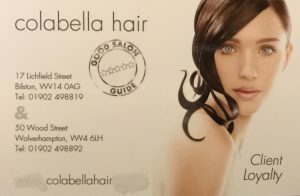 For every visit to the salon wether its for hair or beauty you will receive loyalty points. once your loyalty card is full choose from our selection of treats. You could receive a discount off your next bill, a salon professional product or a free salon service. Our menu of offers change daily please ask at reception for more information. 20% Student discount valid weekdays only.